(Bloomberg) -- A Bollywood biopic of India’s prime minister is set to hit theaters days before the country’s general election begins, raising demands from the political opposition that its release be delayed until after voting. The movie is based on the life of Narendra Modi and is scheduled for release April 5, just before the country goes to the polls on April 11 in a sprawling, six-week electoral process that wraps up on May 23. India’s opposition Congress party has approached the Election Commission of India, claiming the film is politically-motivated and asking for its release to be stalled. Randeep Singh Surjewala, a Congress lawmaker and party spokesman, did not respond to a call and text messages for comment. A trailer of the movie, “PM Narendra Modi,” features stirring music and plenty of action as it retells Modi’s path from working as a tea-seller in small-town Gujarat to winning the nation’s highest office. “An ordinary tea seller can never become the country’s PM,” a voice-over says before the trailer shifts to a crowd chanting Modi’s name. The film also shows Modi as a young boy saluting the flag, venturing on a spiritual sojourn in the Himalayas and later dispensing an aphorism to tycoon Ratan Tata as the chief minister of the western state of Gujarat. 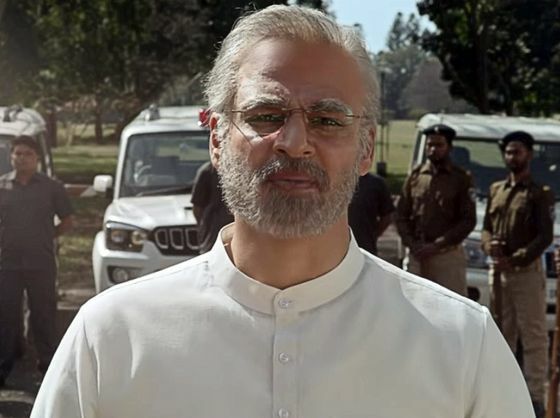 Near the end of the trailer, the actor playing Modi warns arch-rival Pakistan not to test India with terrorist violence, an allusion to tense geopolitical developments that have recently colored Indian politics. “If you strike us again, we’ll strike harder," Modi says, before the trailer ends with a younger version of Modi holding the Indian flag and yelling, "Glory to Mother India," as snow falls around him. The Congress’ complaint to the Election Commission prompted a law firm representing the film’s producers, Legend Studios, to file a response in late March. The firm said claims that people involved in the film had ties to Modi’s ruling Bharatiya Janata Party were untrue. Showing a film about Modi around election time is no different than publishing a book on him, and banning a biopic would violate the film producers’ freedom of speech, said Hitesh Jain, a lawyer with Parinam Law Associates, which is acting on behalf of the film’s creators. “PM Narendra Modi” isn’t Bollywood’s only contribution to the recent political discourse. Other recent releases have included “Uri: The Surgical Strike,” which dramatizes a military mission Modi approved against Pakistan in 2016, and “The Accidental Prime Minister,” an unflattering portrait of the former Congress premier Manmohan Singh.